From Goodreads ~ "Risky Business". "Revenge of the Nerds". "Better Off Dead". "Moonlighting". "Supernatural". "American Dad". "New Girl". What do all of these movies and television shows have in common? 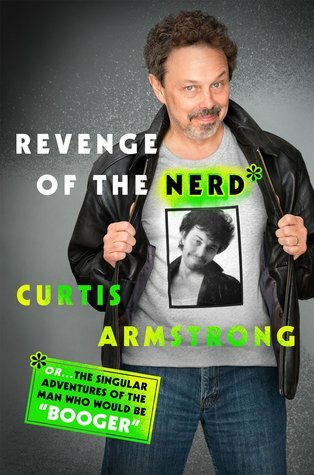 A legendary comedic second banana to a litany of major stars, Curtis is forever cemented in the public imagination as Booger from "Revenge of the Nerds". A classically trained actor, Curtis began his incredible 40-year career on stage but progressed rapidly to film and television. He was typecast early and it proved to be the best thing that could have happened. Born and bred a nerd, he spent his early years between Detroit, a city so nerdy that the word was coined there in 1951, and, improbably, Geneva, Switzerland. His adolescence and early adulthood was spent primarily between the covers of a book and indulging his nerdy obsessions. It was only when he found his true calling, as an actor and unintentional nerd icon, that he found true happiness. With whip-smart, self-effacing humor, Armstrong takes us on a most unlikely journey - one nerd’s hilarious, often touching rise to the middle. He started his life as an outcast and matured into ... well, an older, slightly paunchier, hopefully wiser outcast. I like reading bio/autobios and this one caught my eye because I have seen Revenge of the Nerds a few times so knew who Booger was, which was played by Curtis Armstrong. This is the author's story. He was born in Detroit in the early 1950s. His maternal side is Italian-immigrant working class and his paternal side is American "executive class". As he was growing up, he was aware there was racial and class hostility between the two families. His father was transferred to Switzerland for a few years when Curtis was young and they eventually moved back to Detroit. Curtis became interested in acting and his first love was/is the theatre. The book starts off with the telling of the author's childhood and then moves on to have a chapter devoted to some of the more well-known things he has done ... movies like Risky Business and Revenge for the Nerds and TV shows such as Moonlighting, Supernatural and The New Girl. It was interesting to get the behind the scenes scoop of his experiences from his point of view. Some of the things he talked about weren't overly complimentary (like how frisky Tom Cruise was during the shooting of Risky Business and the tensions between Cybill Shepherd and Bruce Willis during Moonlighting) but he did it in an honest and not mean manner. For the most part, I liked the writing style and found it amusing. I think he'd be fun to have a beer with. I found the book a bit slow in the beginning, though, but thought it picked up with chapter about Revenge of the Nerds and onwards. The focus is on his career and there is very little about his personal life (his wife and famly). As a head's up, there is swearing.